Online marketing has brought in tons of options for marketers and advertisers to expand. Content Marketing and SEO is good to bring in organic traffic, but do you know clicks on paid search listings beat out organic clicks by nearly a 2:1 margin? 64.6% of people click on Google Ads when they are looking to buy an item online! But online ad campaigns can’t be started just like that. They need to be strategically crafted to bring in traffic, leads, and customers as soon as they start running. Here’s how you can use Google Adwords for your online campaign to shoot up your sales and bring in long term customers. How Do Google AdWords Works? Since people search on Google, how about making your business getting found on Google to people precisely looking for your kind of services? Well, it can be done with Google Adwords, an online advertising program. Your ad can appear to someone when they search for terms related to your product or services, or when they’re on a website with similar content as your business. Before jumping on how Adwords work, here are the benefits of it. Google Ads features a refined targeting system that helps you show your ads to the right people, in the right place, at the right time. Your campaigns can be target specific using keywords, location, demographics, and others. Google Ads offer you complete management over your budget. You choose what proportion you pay for each month, day, or per ad. There is no minimum criterion to hold you back. Google Ads helps you see how many people can see your ads, what percentage can click to visit your website, and even how many clicks to call you. With these pursuit tools, you can even see the actual sales your website is generating as a direct result of your ads. Your ad competes with different ads. Every view is a good prospect and the winner isn’t the higher, it is the most relevant one. Google’s ad auction determines which ads should show. It happens every time someone searches on Google or visits a site that shows ads. How Does the AdWords Auction Work? It happens with every Google search. It decides which ad will appear for a specific search, in which order, and how much the advertiser will pay for that placement. With the example of black shoes, here’s how the auction work? Google Ads calculates a score, called Ad Rank, for every ad in the auction. Ad Rank determines your ad position and whether your ads are eligible to show at all. Generally, the ad with the highest Ad Rank appears in the top position, and the ad with the second-highest Ad Rank appears in the second position (when ads meet the relevant thresholds). What Ads Qualify for the Auction? Advertisers establish groups of keywords to bid on for each ad they produce. Google uses that to find which one is the single most relevant keyword to enter the auction. Ads that have poor relevance, are unapproved, or irrelevant to the query (like targeting a different country), are not shown. Bid: Your bid is the maximum amount of money you’re willing to pay in order for your ad to show. This is also known as your max CPC bid. Quality Score: The quality of your ads is another way of saying the quality score. Not only is it an important factor of the AdWords auction, but there are factors that lie within your quality score that help determine it. Expected impact of your ad: Beyond the quality score, AdWords looks for any ad extensions, such as phone number, email, links to specific pages if your site. This is considered to understand and estimate the impact of the ad on its performance. Search context: Keywords bid, geography, type of location, search term, everything matters to understand the search context. These act as user signals and attributes to understand the Ad Rank. To ensure high-quality ads, each ad has to meet a set quality standard in order to be shown in a particular ad position. 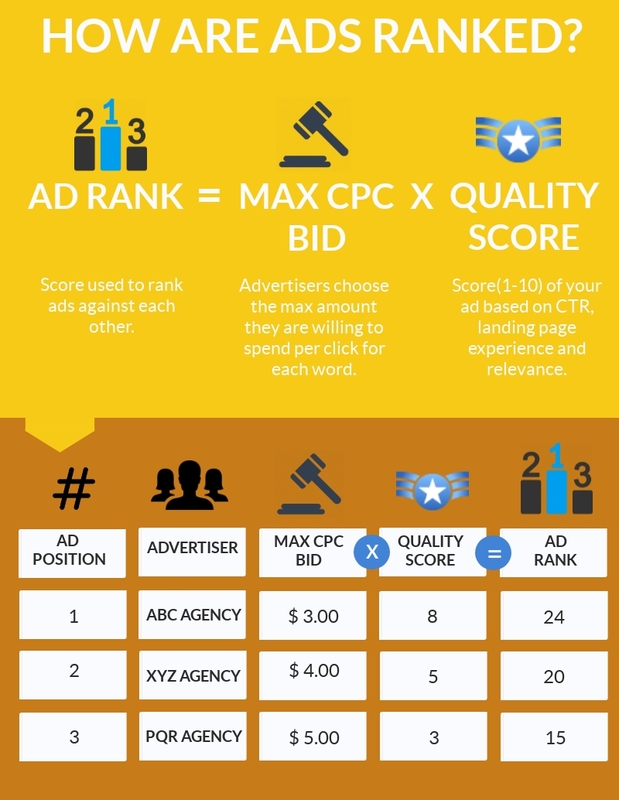 This is beneficial because if you’re using highly relevant and accurate ad extensions, your ad might rank higher, even if your competition has a higher Max CPC Bid. The auction system is set up in order that advertisers only ought to 1 cent beyond the advertiser below them. However, advertisers with a lower bid will rank beyond a better bidder if they have an ad that features an equally high-quality score. If you look at the chart above, XYZ agency bid $1 more than PQR Agency but ranked lower because their quality score was 2 points lower. The more time you spend on optimizing your ad and your landing pages, the more money you’ll save. Take the guesswork out of your advertising strategy and shoot up your sales with Google Ad words. 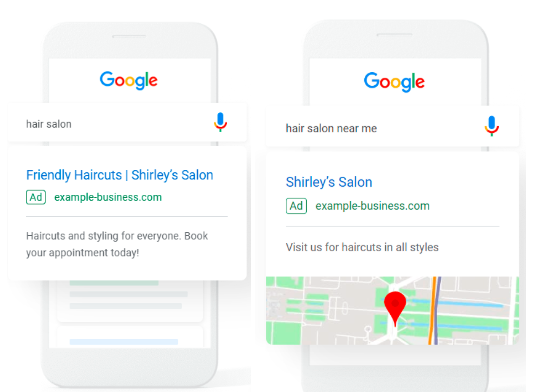 With text-based search ads, graphics display ads, YouTube video ads, or in-app mobile ads, you have plenty of ways to reach your target customers. We help you show laser-targeted ads to your potential customers on social and save on ad waste.